Did you know that Gmail updated their DMARC policy in June 2016? Did you know that this effects you if you’re using an @gmail.com address to send emails through somewhere like ConvertKit, MailChimp, or Mad Mimi? Many bloggers were unaware that the DMARC policy existed–let alone applied to them–until they saw a warning in their MailChimp or Mad Mimi account. In brief, the DMARC policy change means it is no longer recommended that you send your email campaigns from your @gmail.com address (or any other free address domain like yahoo.com, hotmail.com, etc.). DMARC stands for “Domain-based Message Authentication, Reporting & Conformance”. What this means to you is that any time you’re sending an email through a third party (i.e. your email service provider like ConvertKit, MailChimp, or Mad Mimi), you need to be sending those from an email address at your domain, not from a free email address domain like gmail.com. If you continue to use your @gmail.com address as the “from” address in your email service provider, it’s very likely that your email campaigns will never land in your readers’ inboxes–they’ll probably end up in spam. Let me restate this another way. This does not mean that you cannot use your free email account to email your clients and your readers individually. It just means that you must use an @yoursite.com email address when you’re sending out mass email broadcasts or campaigns through an email service provider (i.e. ConvertKit, MailChimp, or Mad Mimi). If you followed that, you understand that now, all of a sudden, you need an @yoursite.com email address. You probably knew it was a great idea to have an email address that looked professional instead of free. But it always seemed easier to put it off. Well, now is the time. If you need your own professionally branded email address and don’t know which way to turn or how much it will cost, read on. 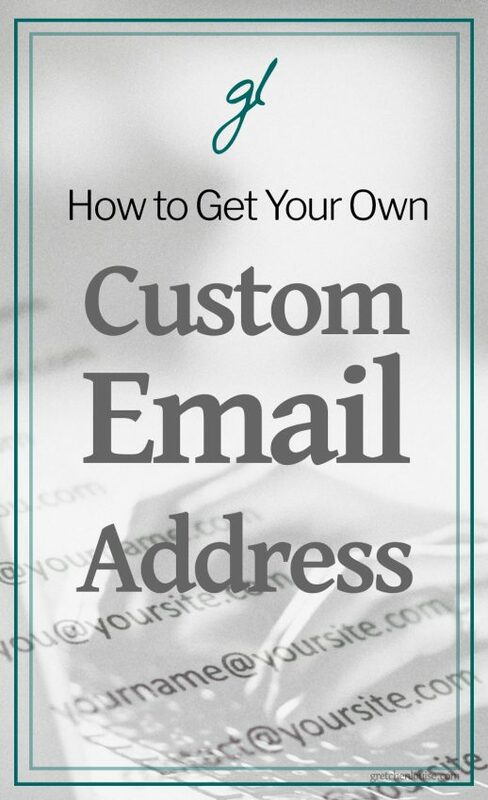 I’ve outlined more than seven options for setting up your own [email protected] email address. Some are free, some are paid; some are less than ideal, some are as easy as using Gmail itself. Regardless of where you have your domain registered or purchased, there’s almost always a free option to forward any mail sent to that domain, or sent to a specific address at that domain, to another address. Pros: Forwarding is instant, super easy to setup, and free. Cons: If you get any spam sent to [email protected] and it’s forwarded automatically to [email protected], then it will be yoursite.com that Gmail will associate with the spam. This is a great way to get on the fast track to having yoursite.com blacklisted for spam. There is also no way to tell if forwarding suddenly stops working–until you start realizing you’re missing emails. Choose This: If you don’t care about your domain’s integrity. If you visit your web hosting cPanel, you can usually set up almost any number of email accounts for free (though there are a few hosts who do not provide this service). The storage of your email account is only limited by the storage you’re paying your webhost for. Access: Login to your webmail at yoursite.com/webmail and choose from Horde, Roundcube, or SquirrelMail, or access your email account via SMTP or POP using any email app or email software. Pros: Fairly simple to setup, this option gives you the most bang for your buck, as you’re getting email hosting right along with your web hosting. Cons: If you’re using to Gmail, you’ll find the features of Horde, Roundcube, and SquirrelMail lacking, to say the least. If you change hosts, it can be a challenge to move your email account, too, and change your email settings everywhere you send/receive email. Spam protection is usually not as robust as Gmail’s. If your host goes down, so does your email. Choose This: If you’re looking for the cheapest option with the least storage restraints. If you go to your Gmail Settings, you can download external email accounts right into your Gmail inbox via POP, and send from those same accounts via SMTP. Access: Your @yoursite.com emails will land right in your Gmail inbox witih the rest of your email (you can choose to automatically label all @yoursite.com email to differentiate it). Pros: No additional cost because you’re using your own free Gmail account. It keeps all your email in the same place. Cons: Gmail does not download new mail instantly: it checks at random, sometimes at 20 minute intervals, sometimes at 2 hour intervals. You can check it manually by clicking the gear icon, choosing “Settings”, choosing “Accounts and Import”, and clicking “Check Now” on your account of choice–but that’s a pain. Choose This: If you want to keep everything in one inbox or if you love Gmail but don’t want to pay for Google Apps. Zoho Mail provides free @yoursite.com email account hosting with up to 5GB storage. Pricing for 10GB storage and up starts at $2.50/user/month. Access: Webmail via Zoho Mail, the Zoho Mail app, or any other email app or software. Pros: Free startup. Cheaper pricing than G Suite. A suite of features similar to G Suite. Cons: It’s not Gmail. It doesn’t integrate with Google Drive and your other Google apps. Choose This: If you’re not attached to Google. If you’re looking for a budget-friendly option. Rackspace is another reputable stand-alone email provider which is said to have great customer service. Pricing starts at $2/user/month for 25GB of storage. There’s also a free trial so you can see if you like the features. Access: Webmail, Outlook, and mobile apps. Pros: 24/7 “fanatical” customer service. Free migrations from your previous email service. Choose This: If you’re not attached to Google. Access: Webmail via Gmail.com, the Gmail app, or any other email app or software. Pros: It’s Gmail. It has Gmail’s powerful spam protection. It has all your favorite features. Choose This: If you can’t imagine life without Gmail and are already addicted to all things Google. Depending on which version of Office 365 you have, you can connect your domain to Office 365 for an @yoursite.com email address. They also offer email only plans starting at $4/user/month for 50GB storage. Access: Office 365 Webmail, Outlook, Outlook app, all other email apps and software. Choose This: If you’re a fan of all things Microsoft. If you love Outlook. If you’re already paying for Microsoft Office 365 Business Premium or higher. Many domain registrars also offer email hosting, as well. Options and pricing vary depending on your registrar. Here are direct links to check out pricing for GoDaddy Professional Email, NameCheap Private Email Hosting, and Network Solutions Professional Email. What about SPF and DKIM? Start by contacting your host to see what they offer and what they recommend. Some hosts, like Media Temple, allow for G Suite setup and billing right within your hosting account. Flywheel hosting (one of the hosts that does not offer email services) has a helpful FAQ about the options available. You can still use solutions 3-7. Check out WordPress.com’s email help page for more info. Whatever option you choose, don’t forget to set your new custom branded email address as the “from” address in your email service provider. Then be sure to add the account to your regular email software, install it on your phone, and check it regularly. The last thing you want to do is miss replies from your readers! This is really helpful Gretchen! Thank you – I’ve been passing the links on to clients :)! Gretchen is prompt and professional. I recommend her to anyone who sees a line of code and starts to hyperventilate.